These minimalist stacking rings, handmade of recycled brass, enable Kenyan artisans to make a good living. Whether you wear them stacked or solo, these contrasting minimalist rings will help you get your glow on. But there’s also more going on than meets the dazzled eye. 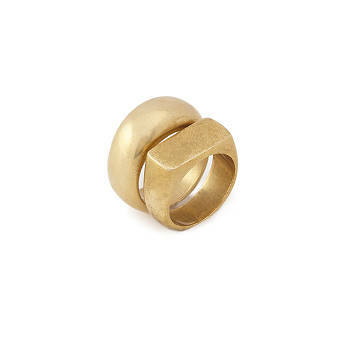 Both—the curvy, cigar-style ring and the angular, signet-inspired one—were made of recycled brass with traditional, simple techniques by artisans in Kenya. Working with Nairobi-based fellow B Corp Soko has plugged these women into the world market. They've been able to increase sales and raise their incomes while working close to home and taking care of their families. It’s a shining example of win-win. Handmade in Kenya.